Kirtana has been performed throughout the ages, but its real glory importance was revealed five hundred years ago when Sri Caitanya Mahaprabhu desended to this world. In the lineage of Sriman Mahaprabhu, all prominence is given to kirtana. It is his life and soul and also the life and soul of his followers. The soul's only true requirement and very sustenance is to pray to the lord and glorify him. Day and night, Sriman Mahaprabhu, who is none other than Sri Sri Radha-Krsna combined, would subsist on the kirtanas sung to him by Svarupa Damodara and Raya Ramananda. He never went for a moment without kirtana. His principal instruction was to always perform kirtana Sri Hari Kirtaniya sada harih. Nothing pleases Him more than sincere kirtana. Srila Narottama dasa Thakura made these lofty conceptions more accessible by delivering them in the vernacular dialect of the Bengali language, composing numerous prayers to the divine personalities exalted by Gaudiya Vaisnavas. Following this era, many Gaudiya Vaisnavas composed wonderful kirtanas, but none has been more prolific than Srila Bhaktivinoda thakura. He made the deep moods contained within these songs more accessible. He wrote over two hundred eighty covering a wide variety of topics. Some songs give stern instructions to the mind thus guiding the sadhaka struggling with material desires; some songs are prayers imbued with a mood of surrender, other are saturated with intense hankering for ultimate perfection and some sons glorify the sweetness of the Divine Couple's names, forms, qualities and pastimes. Following him Srila Bhaktisiddhanta Sarasvati Thakura prabhupada initiated a wave of kirtana rasa that was soon to engulf the entire world. 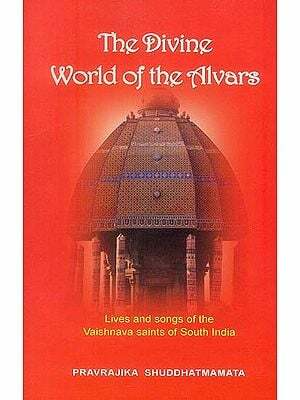 He was the personification of Srila Bhaktivinoda Thakura's intense desire to inundate every corner of the globe with kirtana, for the benefit of all jivas. Through Srila Bahktisiddhanta Sarasvati Thakura, the holy name and the kirtanas of his guru varga were spread throughout the length and breadth of India. He inspired multitudes of young men from all walks of life and empowered them to spread the mission of Sri Caitanya Mahaprabju through the beauty of kirtana both sung and spoken. Sri Srimad Bhakti Prajnana Kesava Gosvami Maharaja continued this preaching mission with the same zeal, emphasizing the importance of kirtana and reminding religious persons and other that in Kali yuga, sincere kirkana is our only means of attaining ultimate auspiciousness. 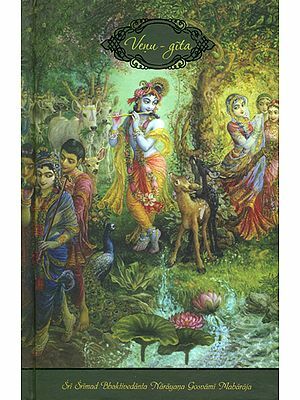 The beautiful Kirtanas he wrote are esoteric and instructive, imparting the lofty tenets and very essence of Gaudiya Vaisnavism. Prominent among the disciples of Srila Bhaktisiddhanta Sarasvati Thakura was one who fulfilled the prediction of Srila Bhaktivinoda thakura that one day peoplethe world over, both Indians and westerners, would joyfully dance together in the bliss of kirtana. That personality was Srila Bhaktivedanta Svami Maharaja (Srila Prabhupada.) in 1965 at sixty-nine years of age, he brought the blissful waves of Gaudiya Kirtana to Western shores. Thousands of Young men and women upon witnessing his heartfelt kirana, glimpsed the bliss of a higher state of consciousness. Enlivened by the sheer delight kirtana bestows, they wanted to share that happiness with other. Through them. Srila Bhaktivedanta Svami Maharajaa introduced Kirtana culture to nearly every country on the planet. Following him, Sri Srimad Bhaktivedanta Narayana Gosvami Maharaja also preached extensively throughout India and the world. With great specificity he focused his audiences on the most precious jewels within the depths of Gaudiya literature and kirana, so as to fortify an understanding of the highest goal and fix one on the path of attaining it. He emphasized that the prayers of conditioned souls, being full of mixed desires and ulterior motives, divert us from attaining that goal. For this reason, he explained, we benefit by singing the prayers of our acaryas, who are abodes of mercy and who have written songs free of any material tinge. 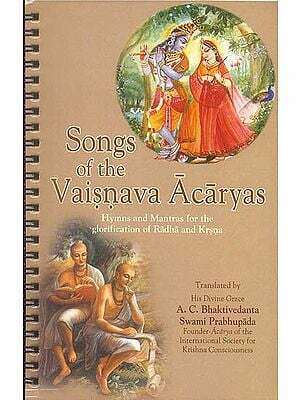 If we sing their songs sincerely, we will glean how to correctly approach Sri Hari, Guru, and Vaisnavas. 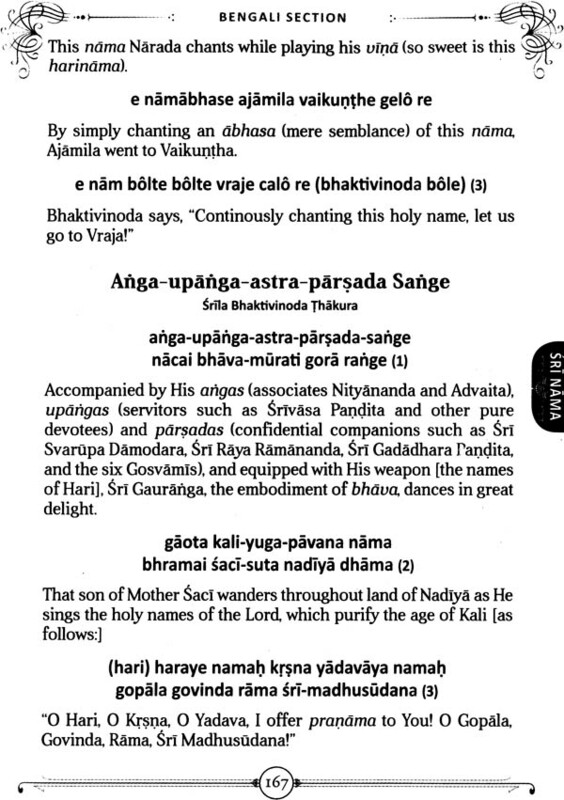 Sri Gaudiya Giti-guccha was first published on Gaura Purnima, 1957, by Sri Srimad Bhakti Prajnana Kesava Gosvami Maharaja. 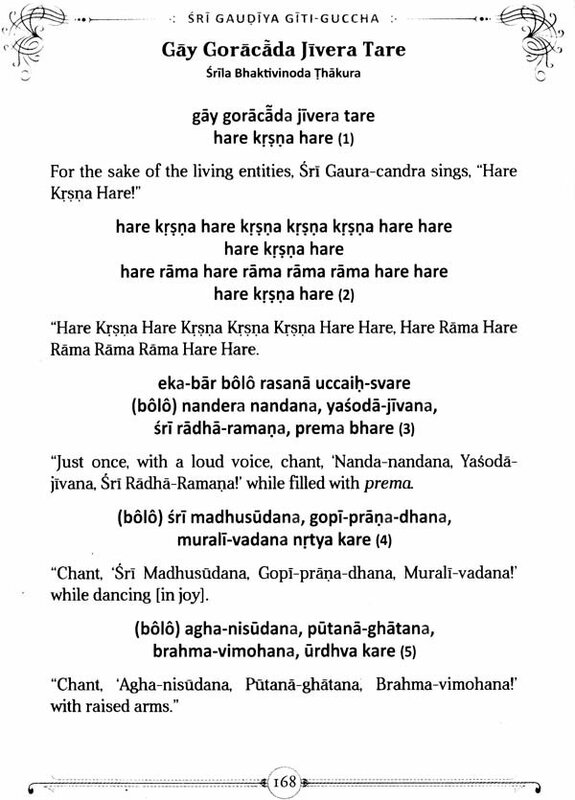 He compiled many different kirtanas by Vaisnava authors, from before the time of mahaprabhu to the present day, and arranged them in order according to language, subject and mood, Guccha means a Cluster and these songs have been clustered in a most beautiful way, like a bouquet of flowers. This forms the basis of this current English edition. 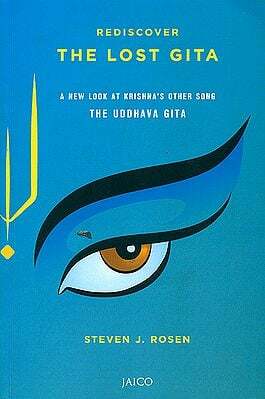 Therefore, Sri Gaudiya Giti guccha, an anthology of Gaudiya Vaisnava songs is a treasure house of prayers, cherished and sung by one who is a sadhaka (Practitioner of Bhakti) as well as by one who is a siddha (perfected devotee). Our acaryas emphasize the necessity of praying of one's gurudeva, the Vaisnavas, and so forth, before commencing any act or supplication. For this reason, the marigalacarana is recited before kirtana begins. In traditional Gaudiya Kirtana songs are first sung to Sri guru, then the vaisnavas Sri Sri Gaura Nitai about the process of surrender (saranagat) and then to Sri Sri Radha – Krsna. 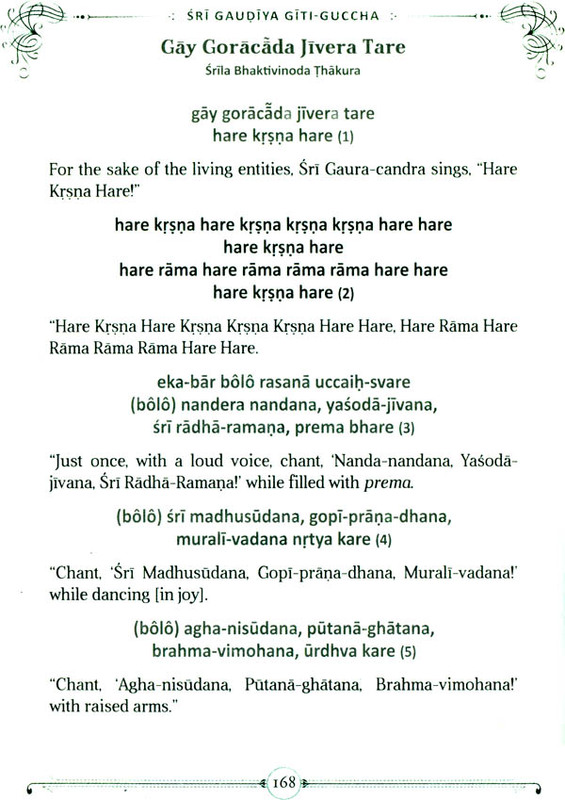 The kirtana session ends with the singing of the maha mantra. To facilitate the learning of verses by heart, the translations are presented in simple language, adhering to the grammatical structure and word order of the original verses, to the extent that this possible. We have inserted words in square brackets that convey the subtle inferences in the square brackets. Parentheses are used in two ways, sometimes the original song itself has parenthetical wording so this is transferred to its translation. Otherwise, parentheses are used traditionally, to simply define a word or term. In this book we have followed a scheme specifically designed to aid authentic pronunciation. We have added in three new characters J.d. and o. J is pronounced exactly the same as J and o is pronounced exactly the same as O but the marks are added because the spelling affects the meaning (Java means all glories and Java means he or she goes). The letter d is similar to the American pronunciation of it in butter. In Bengali the 'a' at the end of a written word is sometimes not pronounced. In this book such as are in gray scale. However, the silent 'a's are sometimes pronounced to fill in the meter. We have left these 'a's in gray scale. The singer can decide whether to pronounce them or not. To save confusion we have eliminated any silent 'a' that breaks a meter. 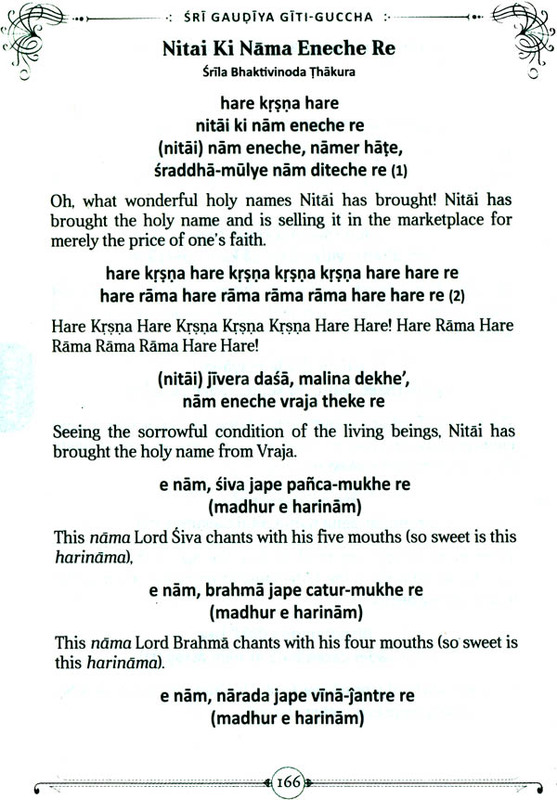 According to Bengali Gaudiya tradition a song is known by its introductory words; it has no separate title. We have therefore entitled the songs herein according to their initial few words. Exception are the arati songs, and all the stotrams. We are in the process of translating more kirtanas, gathering bona fide explanations of kirtanas, writing explanations on how to sing them, and recording them being sung. We will gradually be posting all this on our website.